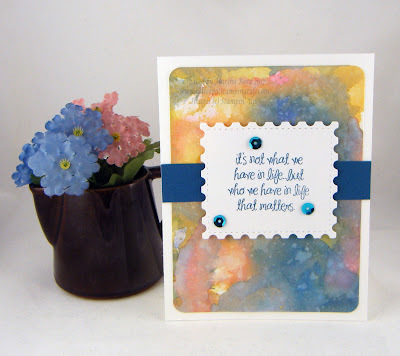 Today finds me combining challenges and playing with my new Tim Holtz Distress Oxide Inks. It's my first chance to do so since I purchased them. They are a lot of fun. 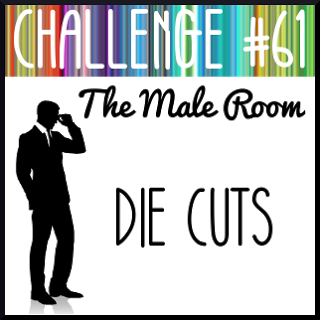 I love that you can keep adding layers of color until you get the look you want or like best. You have to dry them between applications to keep them from turning muddy but it's so worth the effort. 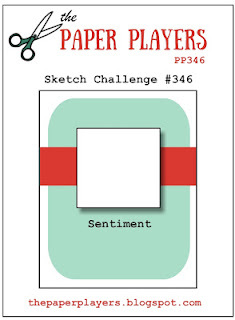 The sketch from The Paper Players Challenge was perfect for making my own background layer. At first I wasn't so sure about it but kept adding layers of color and I finally had a background I liked. Adding a Taylored Expressions Postage Stamp Stacklets die-cut, which is part of The Male Room Challenge, let me showcase that great sentiment from the Thankful Life stamp set by Stampin' Up! A few sequins and perfect guy card is created. Yes, I have to get some oxide inks. Love the wonderful background you created. Thanks, Heidi! I love those oxide inks. I just need to play with them more.